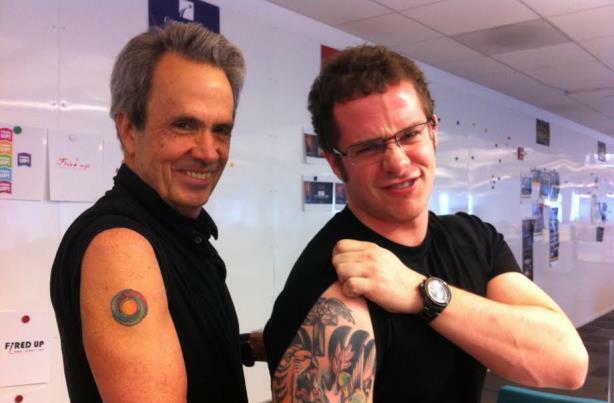 "There's nothing more committed than getting something stuck on your skin for the rest of your life," Golin CEO Fred Cook said about his first tattoo, the g4 logo. Golin’s g4 model is here to stay – at least on CEO Fred Cook’s arm. The Golin chief executive took his dedication to the agency model, which it put into motion in late 2011 and focuses on areas of expertise rather than traditional PR silos, to a new level by getting the g4 logo tattooed on his right arm in late December. "There’s nothing more committed than getting something stuck on your skin for the rest of your life," Cook said in an agency video documenting the experience that made an impression. Fred Cook's Go All In Day from Golin on Vimeo. The model organizes agency staff around four areas of expertise rather than traditional PR silos. So instead of titles ranging from assistant account executive to MD, Golin staffers are split among strategists, creators, connectors, and catalysts. The firm also rebranded as Golin from GolinHarris last June to emphasize its evolution. "I learned a few things about tattoos; number one is they don’t hurt as much as you’d think. Number two is that it takes a few days for the real colors to come in, and number three is everyone told me go big or go home," Cook said. "We’re starting 2015 with some big bets, and one of the biggest bets is on g4. It’s more than our business model and the way we work, it’s who we are and what makes us special."